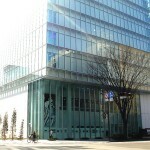 http://www.shozankan.com and won prizes many times. The interior is designed with lively diamond motifs and the theme colors of red, black and gold which together create a modern atmosphere. You will sit down in the comfortable “hideout” space of either the counter seat or the stylish private room. Seafood from Sanriku area and seasonal fresh ingredients from mountains and woods are cooked. Enjoy the Japanese traditional cuisine with the brand sake Katsuyama. 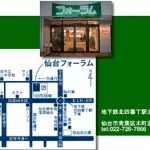 Lunch starts from 11:30 to 14:00. Lunch set of dishes start from 2,500 yen. Dinner starts from 17:30 and stops orders at 20:30. 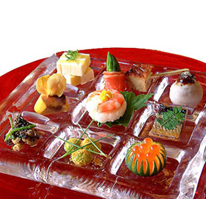 Appetizer plate starts from 2,500 yen. Dinner dishes from 4,500 yen.